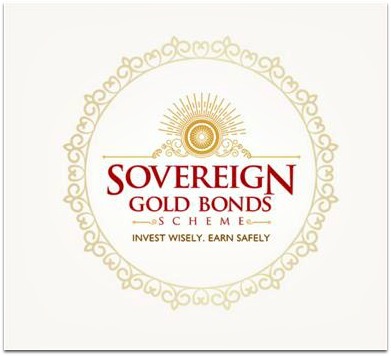 Sovereign Gold Bonds Scheme is an indirect way of investing in Gold. Instead of buying physical gold, investors can buy gold in paper form through Sovereign Gold Bonds. These bonds track the price of gold, plus an extra interest amount is paid on the investment. This is the second tranche of the Financial Year 2017 – 2018. The Gold Bonds scheme was launched in November 2015. The Budget (2017) has set a target to garner as much as Rs 5,000 crore from the three gold schemes for the fiscal 2017-18. These schemes are namely – Sovereign Gold Bonds, Gold Deposit Scheme & Indian Gold Coins. Applications for the latest ‘Sovereign Gold Bonds Scheme’ will be accepted from 10th July, 2017 through banks, Stock Holding Corporation of India Limited (SHCIL) and designated post office branches. Latest Issue Subscription dates : 10th July, 2017 to 14th July, 2017.
Who can buy Gold bonds? : The Bonds will be restricted for sale to resident Indian entities including individuals, HUFs, trusts, Universities and charitable institutions. Duration of Bonds : The tenor (tenure) of the Bond will be for a period of 8 years with an exit option from 5th year onwards. Gold bonds shall be repayable on the expiration of eight years from the date of the issue (i.e., 28th July, 2017) and premature redemption is permitted after 5th, 6th and 7th years from the date of issue of SGB. Maximum allowed investment : The maximum amount subscribed by an entity or an individual investor will not be more than 500 grams per financial year (April-March). A self-declaration to this effect will be obtained. In case of joint holding, the investment limit of 500 grams will be applied to the first applicant only. Where to buy Gold Bonds ? 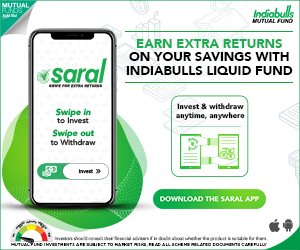 : Gold Bonds can now be purchased from NSE and BSE, besides all Bank branches, select Post Offices and the Stock Holding Corporation of India Limited (SHCIL) and as may be notified, either directly or through agents. Payment mode : Payment for the Bonds will be through cash payment (upto a maximum of Rs. 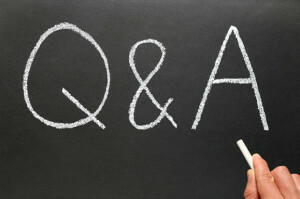 20,000) or demand draft or cheque or electronic banking. The investors will be issued a Holding Certificate. The Bonds are eligible for conversion into demat form. KYC Documentation : Know-your-customer (KYC) norms will be the same as that for purchase of physical gold. KYC documents such as Voter ID, Aadhaar card/PAN or TAN /Passport will be required. Transfer of Bonds : The bond can be gifted/transferable to a relative/friend/anybody. Redemption Price : The redemption price will be in Indian Rupees based on previous week’s (Monday-Friday) simple average of closing price of gold of 999 purity published by IBJA (Indian Bullion Jewelers Association). Collateral : Gold Bonds can be used as collateral for loans. The loan-to-value (LTV) ratio is to be set equal to ordinary gold loan mandated by the Reserve Bank from time to time. Liquidity & Tradability : Bonds will be tradable on stock exchanges within a fortnight of the issuance on a date as notified by the RBI. 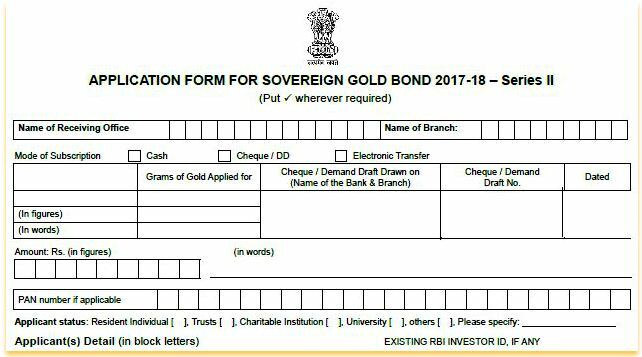 Click on the below image to download Gold Bonds Application form 2017-18 Series -II (July 2017). The interest payments on Gold Bonds shall be taxable as per the provision of Income Tax Act. Gold bonds will be exempted from capital gains (LTCG) tax at the time of redemption. However, kindly note that Long term capital gains arising to any person on transfer of SGB will continue to be taxable and eligible for indexation benefits. TDS is not applicable on the bonds. However, it is the responsibility of the bond holder to comply with the tax laws. Should you buy Gold Bonds? The main benefit of Gold bonds is, you may get capital appreciation (if gold prices increase) plus ‘interest payment’ on bonds. If you buy physical gold or Gold ETFs (which also track gold prices), you may get capital appreciation only. Neither physical gold, gold mutual funds nor gold ETFs pay any interest rate. If you buy Gold mutual funds or Gold ETFs, you have to bear ‘fund management charges’. In case of Gold bonds, no charges are applicable. Also, like gold funds and ETFs, you don’t have to worry about storage of physical gold or pay locker fees in case of Gold Bonds. The biggest disadvantage of Gold bonds is lack of liquidity. The lock-in period is 5 years. But you can sell the bonds on stock exchanges. During last fiscal, stock exchanges BSE and NSE had launched online bidding platforms for SGBs. The exchanges will act as receiving offices for this tranche also. The online platforms are expected to raise demand for SGBs in the demat form. If there are uncertainties across the globe and if the geo-political risks are high, generally Gold prices tend to increase. Investors tend to take refuge in assets like Gold. Personally, I have never invested in Gold. The extent of volatility of Gold prices in the recent years is more than that of Equity oriented securities/funds. So, the risk-reward ratio may not be favorable for investing in Gold. WE ARE NOT RECEIVING THE BONDS IN SOFT OR HARD COPY OF THE SGB. AS SOON AS WE PAID THE AMOUNT. Dear SURESH.. The bonds are issued after the subscription period ends and on/after the settlement date. For ex :The government has fixed the Issue price for next subscription period i.e. December 18th to 20th, 2017 would be Rs. 2,866 per gram with Settlement on December 26, 2017. So, in this case, an investor can get the bonds credited to Demat ac (or)can collect the physical certificates from the service provider after 26th dec.
Should i buy the least priced one or how does it work. Why the variation. Is it because of the interest factor. I’ve been investing in SGB for the past 6 issues. Returns are pathetic except interest, which is very negligible. I lost almost 10% of the value. Noticed the price is always on higher side compared to market even after discount. I’m thinking of selling it off & show it as loss in tax file returns. So, I’ll get little relief on tax. Pl let me know any procedure to declare the losses in income tax. Dear Mukesh ..Offlate, the volatility in Gold prices can be higher than that of in Stock price movement(s). You can exit from bonds through stock exchanges. But Liquidity can be a challenge. Kindly note that Long term capital gains arising to any person on sale or transfer of SGB will continue to be taxable and eligible for indexation benefits. You need to hold the Gold Bonds for at least three years to be termed as ‘Long Term Capital Asset’. The LTCG (Long Term Capital Gains) if any is taxed at 20% with indexation. If you redeem bonds before completion of 36 months (3 years), you have to pay tax on STCG (Short Term Capital gains) which is as per your Income Tax slab. The interest on Gold Bonds shall be taxable. Dear yashpal ..The gold bonds are issued at different points of time with different Issue price, hence you see different Cost price(s) for different Gold Bonds Series/Tranches..
My opinion is that some amount of Gold Bonds should be purchased as a hedging against the risks. Over 4 – 5 Years, it is unlikely that the base price will fall – see this history. Unless of course there is great improvement in overall global economy. In the present scenario, it is quite favorable to invest as it is likely that due to current global tensions, gold will rise. Also, with the demonitization effect wearing off, there will be again be demand for Gold. Dear Manja ..Thanks for sharing your views. Agree with your opinion on gold price Vs expected economic/political scenario.. Thank for your info. But how can per gram cost only Rs.50 where physical gold is amounting Rs. 3000/- something. Dear Soham .. Rs 50 is the discount the Govt is offering to the investors and its not the Issue price. Let’s say if the prevailing Gold price is at Rs 3,000 per gram, the issue price will be fixed at Rs 2,950 per gram. But do you think SIP , Mutual fund are good infornt instead of Gold bonds as there returns are not so impressive. Dear Soham ..Let’s not compare Gold with Equity oriented funds. Are you referring to returns from Gold? Dear Soham ..Gold prices have become too volatile. If you notice, the returns from it has been good over the last few months, thanks to geo-political tensions (US Vs Syria; US Vs North Korea ..). When there are lot of uncertainties across financial markets, investors tend to stock up Gold reserves and demand increases, resulting in increase of Gold prices. This has been the clear case with Gold since 2008. Prior to 2008, the returns from Gold were used to be very stable and not abnormal. Now, it has become very volatile asset. For long-term goals, my take is, it is prudent to invest in Equity oriented products.